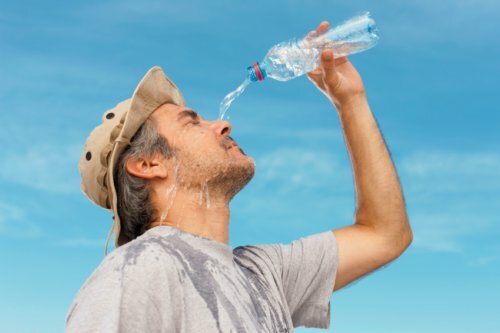 Home » General Health » What’s the Difference Between Heat Stroke and Heat Exhaustion? Both heat stroke and heat exhaustion occur when your body gets too hot. Extreme heat brought on by weather conditions is typically the main cause. But it is also possible to suffer from either of these conditions through overexertion or strenuous exercise. Sweating is essentially the body’s way of cooling itself when it gets hot. In climates that are too hot, however, sweating alone may not be enough and this becomes the root cause of heat exhaustion or heat stroke. Both of these conditions should be taken seriously. If not managed or handled in an efficient manner, your state can worsen and potentially turn fatal. If you are experiencing any combination of the above symptoms, there is a chance you may be suffering from heat exhaustion and must take the necessary steps to treat the condition. I’ll discuss those steps later in the article. Heat stroke is similar to heat exhaustion, except it is far worse. When the internal temperature of the body reaches 104 degrees Fahrenheit, it means you are suffering from heat stroke. Similar to heat exhaustion, heat stroke occurs when temperatures are high or from intense physical exercise. One difference is that heat stroke can actually occur if heat exhaustion isn’t properly treated. The other difference with heat stroke is that it can cause far more damage to your body and your health compared to heat exhaustion. The onset of heat stroke can actually lead to organ damage or failure, brain damage, and in the very worst of cases, it can actually be fatal. Both heat exhaustion and heat strokes are conditions related to heat. That heat can be caused by constant or extreme weather conditions, or it can be brought on by individuals exerting too much energy performing some kind of physical activity. While these two conditions do resemble each other somewhat, it’s important to remember that they are not the same thing. Heat exhaustion is serious, but not critical. It is your body reacting to being dehydrated, feeling fatigued by the heat, or being overworked. Your body may be unable to cool down through sweating. If this happens, you will begin to suffer from the symptoms of heat exhaustion. Heat stroke can actually be brought on by heat exhaustion and it comes with more serious complications. In addition to dizziness, confusion, and nausea, those who have heat stroke may also experience seizures, fevers, and damage to their organs. Find a cool place. If possible, find a building or a home with air conditioning. If that’s not possible, then find a cool, shaded area. Remove as much clothing as possible so the body can begin to cool down. Dampen a wash cloth with cool water and apply to the face. Finally, drink plenty of water. Water will rehydrate the body and help combat the symptoms of heat exhaustion. Avoid alcohol or caffeinated drinks as it can actually worsen the effects. If you believe you are suffering from heat stroke, call for medical assistance immediately. In the meantime, similar principles apply to handling heat stroke as they do to handling heat exhaustion (i.e. stay hydrated and apply a cold wash cloth to the face). Am I at Risk for Heat Stroke or Heat Exhaustion? Stay Inside when it’s very hot outside: The heat is usually at its worst between 11:00 a.m. and 3:00 p.m. If you can avoid going outdoors between that timeframe, that could help prevent heat exhaustion and heat stroke. And if you are someone who is typically physically active, try pushing your activities to later in the evening or earlier in the morning. Heat exhaustion and heat stroke are two very serious conditions. Recognizing the signs and symptoms can be crucial to your health. “Heat exhaustion and heatstroke,” NHS Choices web site; http://www.nhs.uk/conditions/heat-exhaustion-and-heatstroke/pages/introduction.aspx, last accessed December 8, 2015. “Heat Stroke vs. Heat Exhaustion,” Australia Wide First Aid web site; https://www.australiawidefirstaid.com.au/heat-stroke-vs-heat-exhaustion/, last accessed December 8, 2015.